Who hasn’t wanted to see what would happen if a robot goat, vengeful dolphin, zombie ninja, and a peg-faced pirate got into a fight? Who would win and, more importantly, how would they engineer the victory? Would they duct tape a gun onto their existing weapon, light themselves on fire, or bring out the chainsaw nunchucks? If these are questions that have ever tickled your brain, then Legendary Showdown might be the game for you. 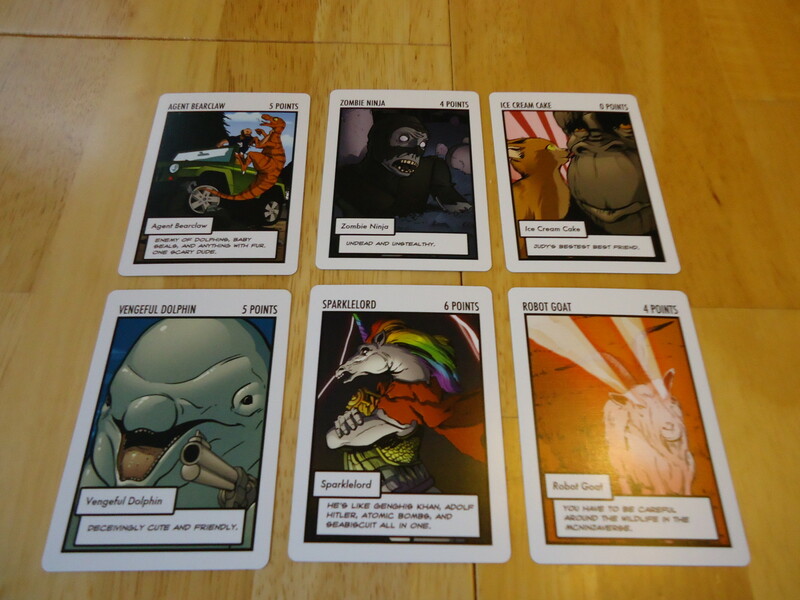 Legendary Showdown is a card game set in the universe of the Dr. McNinja webcomic. Each player has a line of characters and they are battling it out to see who will be the last man standing. 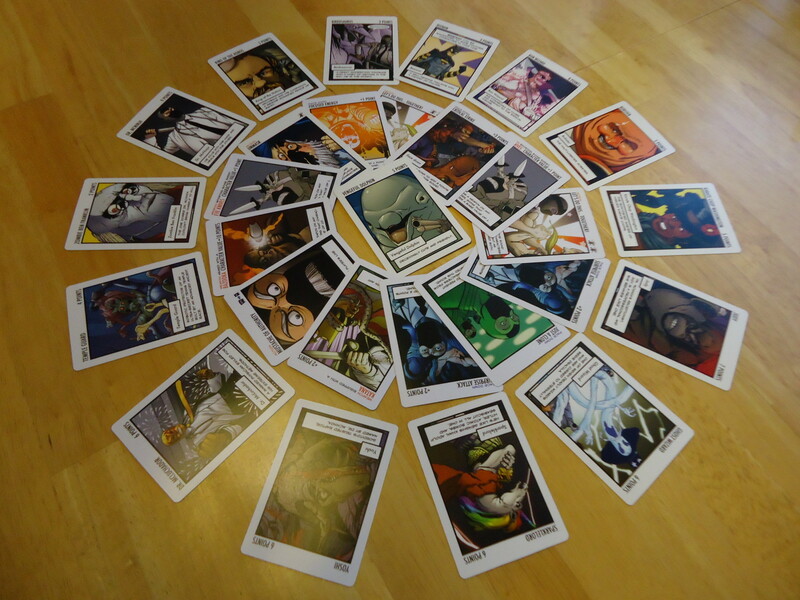 The game consists of two decks of cards: Characters and playing cards. Characters are the people (and critters) that do your fighting for you and who you must keep alive. Each character has a base value of points and your goal is to increase that value and make it higher than the value of other player’s characters. Otherwise, your character is “killed” and eliminated from the game. 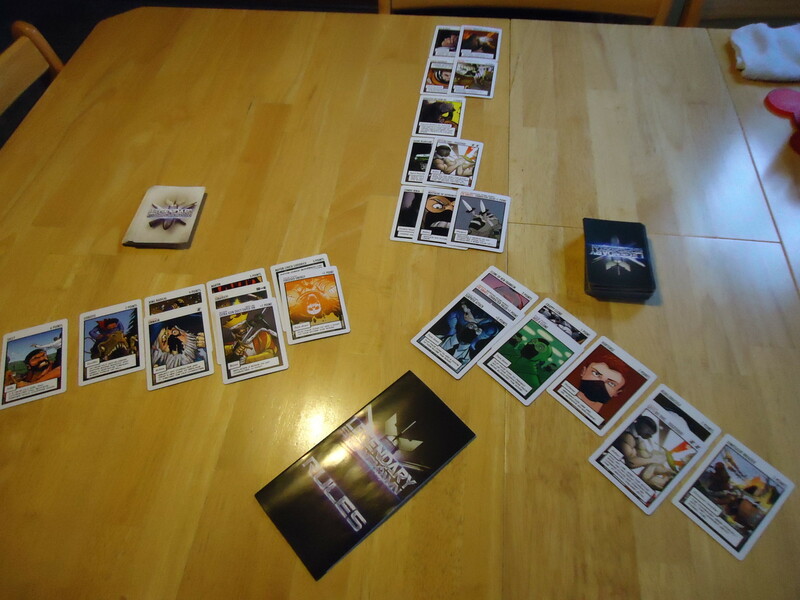 At the beginning of the game, each player is dealt five character cards and these are laid face up in a line in the order in which they were dealt. Face down cards: These are placed face down next to any character line to add a secret bonus. They only apply to the character that is at the front of the line when the round ends. Weapons: Weapons can be played on any character in any line to increase or decrease total points. Each character can only have one weapon at a time and the card stays with them as they move through the line. Bonus cards: Like weapons, bonus cards can be played on any character in any line to increase or decrease total points. Each character can only have one bonus card at a time and the card stays with them as they move through the line. 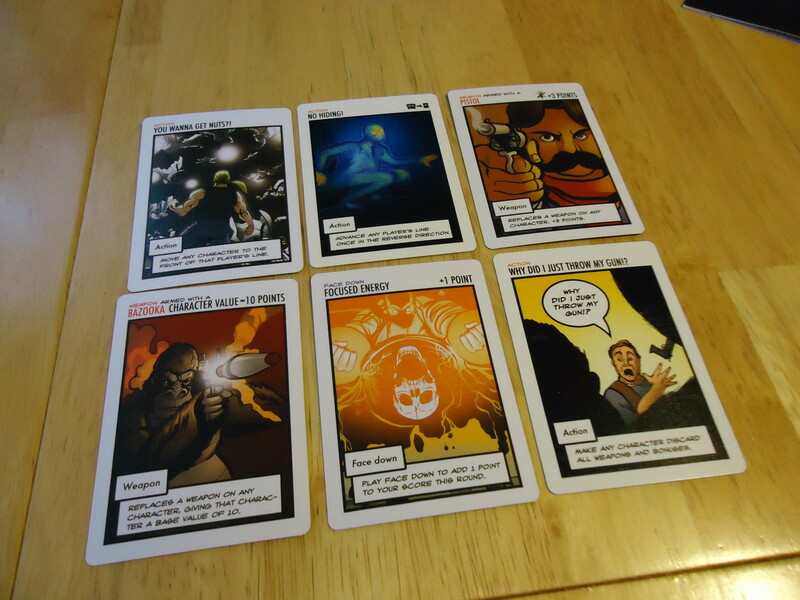 Instant cards: Instant cards can be played at any time during a round and are used to cancel an action. Legendary Showdown is played in rounds. At the beginning of the game, each player draws a hand of five playing cards. On your turn, you can either play cards from your hand or pass. If you choose to play, you can play as many cards as you like and you may play them on your own character line or on that of another player. A round ends when all but one player passes their turn consecutively. Each player then calculates their score by adding all the points from face down cards, weapons, and bonus cards to the base value of the character at the front of their line. The player with the highest total points wins the round. If there is a tie, a sudden death game of “Rock, paper, scissors” settles the tie. The winner’s character survives and is placed at the rear of his or her line, bringing a new character forward for the next round. Everyone else must discard the character from the front of their line, as well as any bonus cards or weapons attached to that character. Players can also discard any remaining playing cards that they do not wish to keep for the next round. All players draw back up to five playing cards and a new round begins. When a player runs out of character cards, he or she is out of the game. The winner is the last player with a surviving character. Show Up For This Showdown Or Run and Hide? First, let me state that I knew nothing about the Dr. McNinja universe prior to receiving this game. I had a good time anyway. All of the characters and actions stand alone and things make sense (at least as much as a game with apes, demonic school teachers, and a “Beeman” can make sense), so you don’t have to know the canon to enjoy the game. Play is simple: You just do what the cards tell you to do. That may mean adding points to your character (or subtracting them from your opponents), switching characters around in your line or in another player’s line, forcing other players to discard weapons or bonuses, sacrificing characters to save other characters, drawing additional cards, combining characters’ points, or potentially saving your character from elimination. You’re trying to give your character the most points (or take enough away from your opponents so that you have the most) so that he/she/it survives the round. However, figuring out how to make that happen isn’t easy. Since a round ends when a certain number of players have passed their turns and not on any set schedule, you never know how many turns you’re going to get. You have to manage your desire to play cards with not knowing how many turns you will have. Do you play all the good stuff up front so you’re sure to get it in, or do you hold back and hope to drop the hammer on an unsuspecting opponent on a later turn? You may think you have more time to play cards and see what other people do, but it’s entirely possible that each turn will be your last. The face down cards add another element of uncertainty to the game. You don’t know for sure what your opponents are putting down, so you have to make decisions based only on the cards you can see. You can make an informed guess once you know the decks, but it’s a guess nonetheless. The fact that cards can be played on any line further complicates your strategy. There may be times where giving points to your opponent may actually work in your favor. Or it could backfire and hand your opponent the victory. You also have to consider what your opponents could do. They could help you bring down another character, meaning you don’t have to expend quite as many cards, or they could opt to look out for themselves meaning you played cards in vain when you didn’t get the help you thought you’d get. You have to figure out where your cards will likely achieve the best effect and then hope that you’re right. There is also a bluffing element to the game. Maybe you pass your turn, leading others to believe that you have nothing, only to pull out a great card on the next turn. (Assuming you have a next turn, that is. Passing your turn is risky because you don’t know if others will do the same and end the round.) Maybe you lay down a low value card at first, hoping your opponents will show their good cards. You want to get other people to reveal their cards without having to reveal too much about your hand, but you also want to balance that with making sure you don’t get shut down should the round end early. Tricky. Even with the best strategy and poker face, some of the game will come down to luck. A large part of this is simply your hand of cards. What you get each round determines what you can do. There aren’t a lot of opportunities to get additional cards, so the five cards you have are pretty much it for the round. If you’ve got nothing great, you may have a hard time winning. But that’s also part of the challenge. Can you make something out of seemingly nothing? Since you’ll play a game of “Rock, paper, scissors” to settle a tie, luck is involved there, as well. It sounds bizarre to settle a tie this way, but it’s actually kind of fun and it keeps well with the bizarre, fun theme of this game. “Rock, paper, scissors” is no more random than duct taping a gun onto your sword, after all. Make no mistake, this game is fun and funny. If you’re looking for a serious card game, look into something like Battle Line or Jaipur. You won’t find any boring merchants or abstract point gathering here. This game is all about the nonsense. It’s ridiculous to arm a dolphin with chainsaw nunchucks and then outfit him with an anti-zombie suit, but these are the kinds of things you’re doing in this game. If you can’t get behind this kind of silliness, Legendary Showdown isn’t for you. If I have one criticism of the game it’s that there aren’t enough cards and many of the cards in the deck are repeated several times. There aren’t a lot of different kinds of weapons and bonuses, and only two instant cards. Once you’ve played a few times, there isn’t anything new to see and some of the silliness can get a bit old. I can see that this game is likely ripe for expansions, though, and if those were to materialize, they would improve the longevity. Finally, you should know that there is a lot of screwage in this game. Since you can play cards on any player’s line, it’s likely that you will be messed with and things can get a bit mean. I didn’t mind because it fits with the theme of the game; this is a battle to the death, after all, and you’ll do anything to survive. However, there are some gamers who don’t like this type of play, so know your audience before bringing this one to the table. Legendary Showdown plays fast and has very little set up time. Since the actions on the cards are very straightforward and you only have, at most, five cards to choose from, there’s very little AP, either. The rules are easy to learn (it really is as simple as, “Do what the cards tell you to do”) so it’s great if you don’t have a lot of time to teach a game. It’s great for a fast filler, or with friends who just want a quick card game. I find it fun on weeknights when I don’t want to think too much and I just want something to get me out of the real world for a while. It’s not a complex or deep game, but it is fun and offers some light strategy choices. 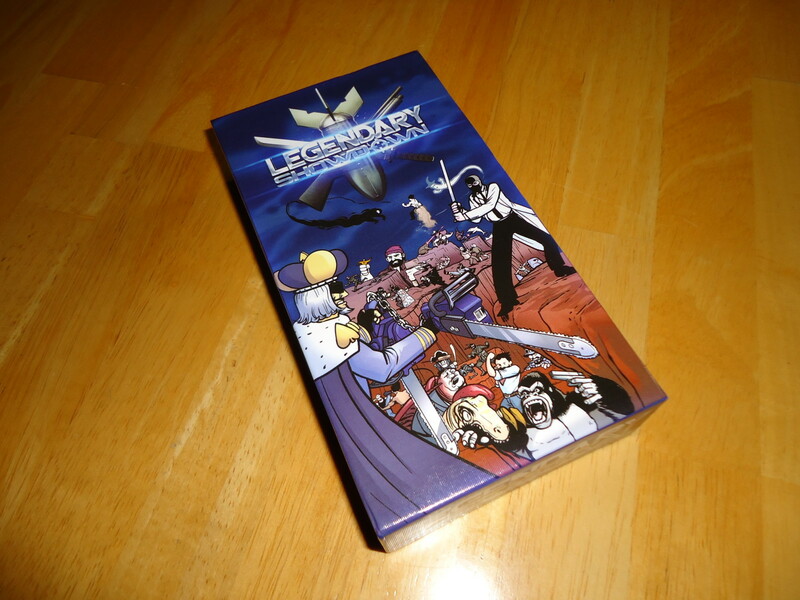 iSlaytheDragon would like to thank Killer Robot games for providing us with a copy of Legendary Showdown. Simple rules make it easy to pick up and play. Good quality cards should stand up to repeated plays. You don't have to know the Dr. McNinja universe to have fun. Portable, light game that doesn't overstay its welcome. There is a lot of randomness, from the card draw to the 'Rock, Paper, Scissors' method of breaking ties. Screwage is a major element in the game, so those opposed to this should avoid.